It's been a busy week of research and today (Saturday) will be a busy day. At 10:00 a.m. today Ginna and I will be meeting a distant cousin of hers, David Teague, and Love's United Methodist Church in Walkertown (NC). The cemetery there is where four generations (at least) of Ginna's maternal ancestors are buried. The Holtons, Carmichaels, Joneses, Dilworths... and who knows how many others. Ginna knows of her grand parents and great grand parents, but David will show us the graves of the two older generations which Ginna was previously unaware of. At 2:30 this afternoon I will be meeting Bev Hamel for a planning session concerning some of our joint research on the families of the Yadkin River (western Forsyth and eastern Yadkin counties). Bev is the author the book Bethania. A lot has been uncovered this week regarding the descendants of Samuel and Mary Harrison of Linville Creek, Augusta Co, Va. It appears this clan moved in the early to mid 1760s to NE South Carolina along the Lynches River. I've also discovered the fact that at least three of Samuel's sons were officers in the SC Rangers, a Loyalist regiment. Of the five sons of Samuel, at least two were killed during the Rev War, and two or three of the remaining sons moved to East Florida, a refuge of many of the Ga and SC Loyalists after the war. Soon thereafter, two of these Harrison brothers moved from FL (and possibly to AL for a time) to the Natchez (Miss) area along the Mississippi River and settled a town called Harrisonburg, which is now in Louisiana. I am in the process of trying to make contact with descendants of these families to further clarify and document these facts. And, of course, any connection of these Harrisons to the Harrisons and Pattersons of York Co SC would be a bonus. I also sent off to the NC Archives a request for 13 land grants of the Yadkin River families, but I'm still waiting to hear back from them as to whether or not they received my online form requests. We'll see. There was a Thomas Patterson who owned land next to a John Ferguson in Chester Co, SC in the 1760s and 70s. Was this my Thomas Patterson? Was this my John Ferguson? The following info is from an online query I found about other Fergusons of Chester Co, SC - but the email address the poster used is no longer valid. UPDATE: I found his web page at http://familytreemaker.genealogy.com/users/f/e/r/Mike-Ferguson-iii-Crowley/index.html but again, the email address is not valid. I am Mike Ferguson III, I have submitted for a Y-DNA37 - Male 37 marker paternal test. I have a well documented family history from my 6th Great-grandparents James & Agnes (Adams) Ferguson of Chester District, South Carolina to myself. Colin I hope from this you can fill in Places, Most Ancient Paternal, Notes & Details. 1.In the book "My Ferguson Ancestors in America 1680-1993" by James Edward Ferguson with major contributions by Walter Whatley Brewster using deed records, wills, etc they have added on the following generations. 8th GGP John Ferguson Sr. married Ann Stubbleson (of Essex County, Virginia) the original immigrant from Scotland. A. In an article by John Markham Ferguson Jr, with a letter from David Dobson (Scottish Writer) research is done that compares a seventeenth century ships passenger list against Virginia headright lists of the same time period. Analysis is that John Ferguson of Essex County, Virginia sailed in May 1666 on the ship Phoenix of Leith out of Leith, port of Edinburgh, Scotland and landed in York County, Virginia before December 11, 1666. There was a James Ferguson who was born ca. 1652 also on this ship. Possibly Johns brother, cousin,?. 2. In the book "The Fergusons of Texas" by Ouida Ferguson Nalle, the books genealogy agrees with mine up to James & Agnes Ferguson. Then the book states the following: "The Ferguson line descends from William Ferguson, called "Old Squire." He fled from Scotland with his three brothers after the death of Olivier Cromwell in 1658. His father, Alpha Ferguson, was killed and his property confiscated by the Crown. Three other brothers who had fought on the side of the king remained in Scotland. A tattered Bible once carried by Old Squire Ferguson in the Cromwell campaigns is a precious possession of the Fergusons of Texas. By 1758 the Fergusons were in South Carolina. They fought in the Revolutionary War." I would like to find out if there is anyone in Scotland who knows these Fergusons who fought during the time of Olivier Cromwell? I noticed in the participation list there are descendants of John Ferguson of Essex County, Virginia who married Ann Stubbleson. It will be interesting to see how well we match up. I’ve been working on a genealogy project for the past month and found your website about the BLACK family. My 5th great grandmother is Nancy Black (b. 1763 in Tryon/Lincoln Co., NC), married to John Hardin Hambright, and according to Bible records in the National Archives, her parents were Gavin and Juda Black. I have military service records for Gavin Black dated 1783 where he served 123 days in the military for the Patriot cause. What I’m finding is that there are so many Gavin Blacks, my head is spinning. Your records show that Matthew and Mary Black are the parents for Gowin (I’m thinking, Gavin) Black. There is a large John S. Black family here in Texas and they are swearing that Gavin Black’s father is George Black…but they are offering no proof. As you may know, George Black was one of the signers of the Tryon Resolves, and was a JP in NC in 1771 (source: Colonial Records of NC). I have no idea where the original story about Gavin Black and George Black got started, but it’s been published in a book, The History of Grimes County, Texas”. This part of the Black genealogy is also published in the Handbook of Texas ONLINE, see article on John Sullivan Black. I’m not one to believe everything I read without sources, so I’m trying to sort out this lineage for myself. Can you tell me more about the BLACK lines from Matthew (I’ve read much of what you have on your site) and do you know if George fits into this anyway? What is your evidence for Matthew Black’s children? Do you have a will?... or are you basing this one the land deeds you’ve mentioned? I’d love to talk to you about this if you have the time. Also, there is a family lore (not from me!) that says that Gavin Black married Sarah Hambright in 1790 and they had 5 children. This surely isn’t my own Gavin Black, Father of Nancy, but as a Hambright family historian, this is really throwing a monkey wrench in the works. I hope you have something to share that will help sort out this mess. B-636: 2 January 1790 James Nickle of Lancaster County, SC, miller to George Minnis of Chester county, weaver, for £30 sterling, 100 acres on a branch of Rocky & Fishing Creek, granted 28 July1769 to Thos Patterson, and by him conveyed to said James Nickle. Signed: James Nickle (mark) (Seal), Witnesses: James Gaston, Thomas Gaston, Eli'r Alexander. Proved: 17 May 1790 by the oath of Eliz'r Alexander before Joseph Lee, J.P.
Notice the following document abstracts, in date order. Looks like there's first a plat, then a grant, then a memorial. I wonder if this Robert Patterson is yours. There are other Robert Patterson records, by the way. Plus, there a bunch of "accounts audited due to claims arising out of the Revolution" for Pattersons, including Robert, Thomas, Peter, William, and several others. As for the Thomas Patterson plat and grant below, also notice the John Ferguson one. I believe these correspond with the one you sent me from the Chester records. Then also notice the James Strain documents, same location. Why is this important? I descend from James Ferguson (son of John Ferguson and Nancy Strain). Furthermore, James Ferguson was married to another Nancy Strain, daughter of James Strain. These are DEFINITELY my Strain and Ferguson bunch. Now, is this Thomas mine? I also think the William Carson is key. He shows up on the Thomas Patterson plat, John Ferguson, James Strain, and James Patterson. I don't know if he was some public official or not, but the Carsons were also connected to the Byers clan. My David Byers was married twice, both times to Carsons (sisters). I guess I need to send off for these documents and see if the originals will show us more details. I'm not convinced yet this is my Thomas, but it's certainly possible. One detail is on the last James Strain document it has Thomas "Peterson" instead of "Patterson". It seems that my Thomas' name was often spelled with a "Pe" instead of "Pa". Description: PATTERSON, ROBERT, PLAT FOR 200 ACRES IN CRAVEN COUNTY. Description: PATTERSON, ROBERT, PLAT FOR 250 ACRES ON TURKEY CREEK. Description: PATTERSON, ROBERT, MEMORIAL FOR 250 ACRES ON TURKEY CREEK, GRANVILLE COUNTY. Description: PATTERSON, ROBERT, PLAT FOR 150 ACRES IN CRAVEN COUNTY. Description: PATTERSON, ROBERT, MEMORIAL FOR 150 ACRES ON SANTEE RIVER, CRAVEN COUNTY. Description: PATTERSON, THOMAS, PLAT FOR 100 ACRES IN CRAVEN COUNTY. Description: PATTERSON, JAMES, PLAT FOR 150 ACRES IN CRAVEN COUNTY. Description: FERGUSON, JOHN, PLAT FOR 100 ACRES IN CRAVEN COUNTY. Description: PATTERSON, THOMAS, LAND GRANT FOR 100 ACRES IN CRAVEN COUNTY. Description: PATTERSON, THOMAS, MEMORIAL FOR 100 ACRES ON ROCKY AND FISHING CREEKS, CRAVEN COUNTY. Description: STRAIN, JAMES, PLAT FOR 150 ACRES IN CRAVEN COUNTY. Description: FERGUSON, JOHN, MEMORIAL FOR 100 ACRES ON FISHING CREEK, CRAVEN COUNTY. Description: STRAIN, JAMES, MEMORIAL FOR 150 ACRES ON CANE CREEK, CRAVEN COUNTY. Today I received two maps from Deed Mapper for plotting the grants and deeds of western Forsyth Co NC and eastern Yadkin Co NC. The Yadkin River is the boundary between these counties and it's the land on both sides of the river that I am researching currently. This involves the Stewarts tracts from the 1700s and many of their relatives and neighbors. This also includes the Brookberry Farm lands on Stewarts Branch. In 1748, George Forbush was still living in Augusta Co Va, as were the Pattersons, Stewarts, Linvilles, Boones, Bryan(t)s, Harrisons, and many other families who would later migrate to the Yadkin River valley of NC. Forbush settled in modern day Yadkin Co NC, and was the namesake for the river, community, and high school with the same name. I have some close friends whose sons both went (or are going) to Forbush High School, some 15 minutes west of my residence. A distant cousin of mine, Harald Reksten, sent me some images via email last night regarding the estate of Samuel Adams, Augusta Co Va, from August of 1748. Adams was the younger half-brother of Robert Patterson, my gggggg-grandfather. Robert Patterson's mother, Margaret Patterson, remarried to John Adams, after her first husband died in the 1710's. She was thereafter known as Margaret Adams, but was the mother of Robert Patterson. In 1748, she was the administratrix of her son's estate (Samuel Adams), and one of the appraisers of his estate was none other than George Forbush. When I saw this last night I just about fell out of my chair. What a small world. Many of these families began their migrations south about that time - 1748. Other members of the same families following over the next few years, settling the Yadkin River valley in the modern day counties of Wilkes, Surry, Yadkin, Stokes, Forsyth, Davie, and Davidson. At the time it was Anson and soon thereafter, Rowan. This morning I was pleasantly surprised with an email from a distant cousin who had found my web site last night. Dave Huskey is a great-great-grandson of William Harden "Bill" Patterson (b 1832), just as I am. Our ancestor, Bill Patterson, was born in the Indian Lands of north Ga in April of 1832, eight months before that section became Union Co (as it is today). I descend from Bill's son Elijah (b 1871), one of Bill's 12 children - and a twin to Elisha Patterson. Elijah or "Lige" as he was called, remained in north Ga for most of his life, although he did live for a year or two in SE Tennessee in a town called Copperhill. That is where my grandpa Clint was born in 1904. Dave, my newly found cousin, descends from Bill's daughter, Venetia Caledonia "Callie" Patterson. Callie later married James Park Hickey and they settled in the Rossville / Chattanooga part of TN, and thus I never had much information beyond their names. Dave graciously filled in a lot of details in his email and even sent a couple pictures of Callie and James, and promises to send more info if I'm interested. Let's see... okay, yes, I'm interested!!! Stumbled across your website tonight and what a delight to find a distant relative and more info on William H Patterson (b 1832). You have certainly done some great research. My name is James Davis Huskey... (some info removed for sake of privacy). My great great grandfather is the same William Harden Patterson. His daughter, Venetia Caledonia Patterson was my great grandmother (whom I met as a child). She died in 1967. I have a few photos of Venetia, her husband, James P. Hickey and their children if you would care to have them sent to you electronically. Plus a little family history of that line. I will attach a few photos now of Venetia Caledonia 'Callie' Patterson Hickey and her husband, James Park Hickey. 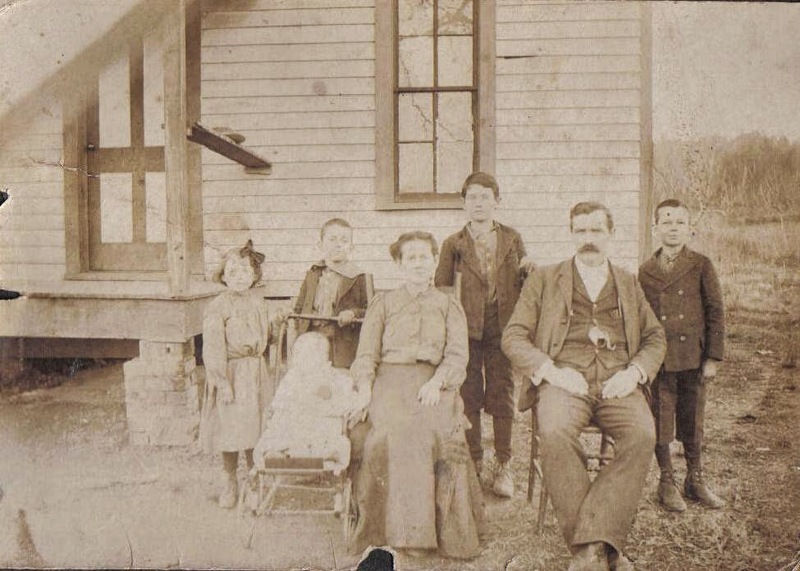 They lived in Bradley County, TN and had eight children - seven living until old age in and around Rossville/Chattanooga. I met all of them as a child. 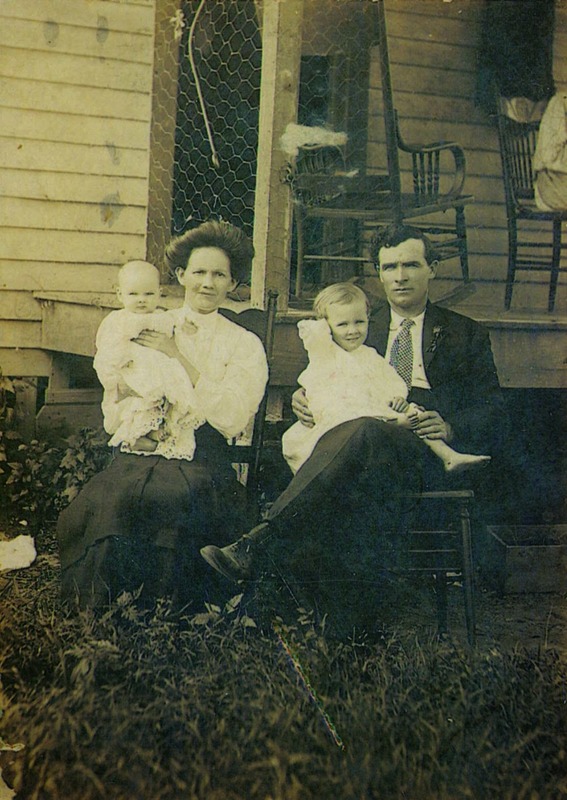 Their daughter, Eula Mae Hickey HUSKEY (b 1902 - d 1987) was my grandmother. Thank you for sharing your research by placing online - to me, it is like finding treasure. By the way - I have a handful of old unidentified photos - perhaps sometime soon I could share those with you. I know they came from my grandmothers house but we have no idea who any of them are - one is quite old. Also curious is you know if a photo of Elizabeth Akins exists.